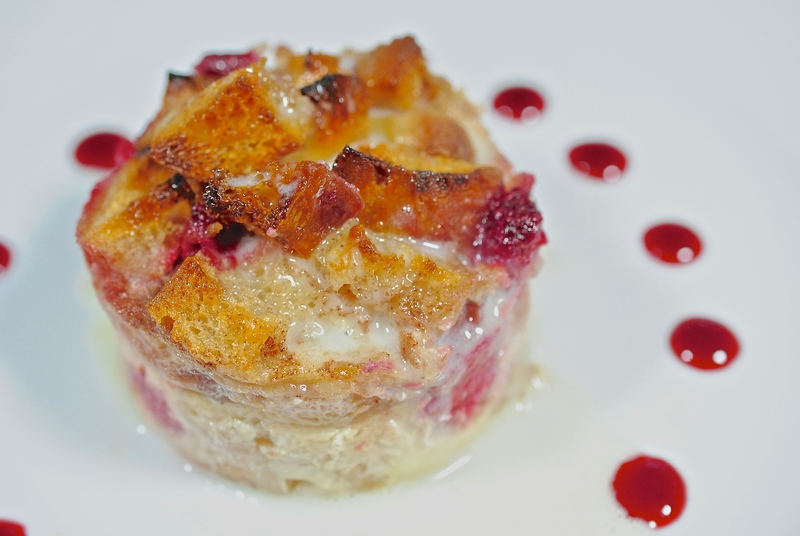 Any bread pudding lovers out there? What better way to start Fall than with something to warm your tummy while you are sitting and watching what’s going on outside? Are you still having warm days as we are here in Texas or are you having some chill in the air and wanting a comforting dessert for the weekend. If you are having one of those days that you can’t get out of the house and you just happen to have some raspberries in the freezer (I have a freezer full) and some bread you threw in there for a rainy day, then you can whip up this dessert for supper. Do you say supper? or dinner?. This dessert screams supper because I picture a dinner being something I have slaved over all day and supper is something I just throw together for the two of us. Unless of course it is our Sunday Night Suppers we do occasionally then I do like to go out of my comfort zone sometimes doing the menu of a couple of new things. This recipes falls into the supper (easy) category. I have to honestly say I have never been a bread pudding lover until I made my Pumpkin Bread Pudding with Caramel Sauce a few years ago and when I did it for a party, everyone loved it. 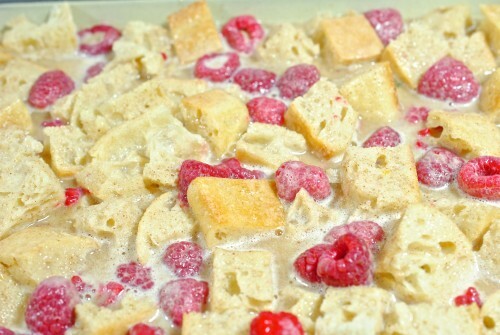 So I’m venturing out again to try this Ciabatta Bread Pudding that I have added raspberries to; I think the raspberries will add some tartness to the dessert to balance the sweetness. I saw this recipe on the Alluvian Hotel (Mockingbird Bakery) in Greenwood, Mississippi website. 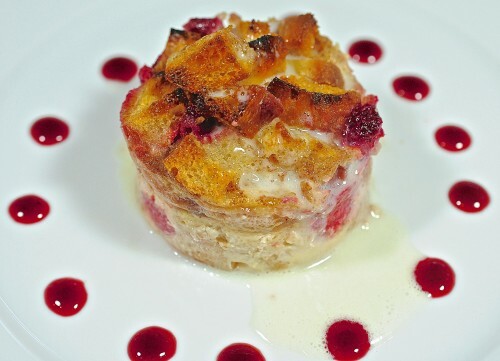 They make a ciabatta bread pudding and top with either ice cream or caramel sauce. 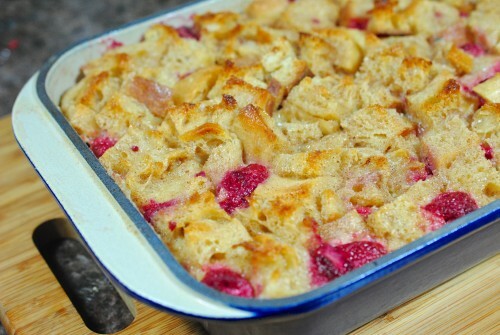 I decided to turn it into a raspberry bread pudding. I didn’t added any whipped cream to the finished dessert but it would be great with a few fresh raspberries as a garnish. BLAST FROM THE PAST: Here’s another bread pudding and this is the recipe I mentioned above — Pumpkin Bread Pudding with Caramel Sauce. 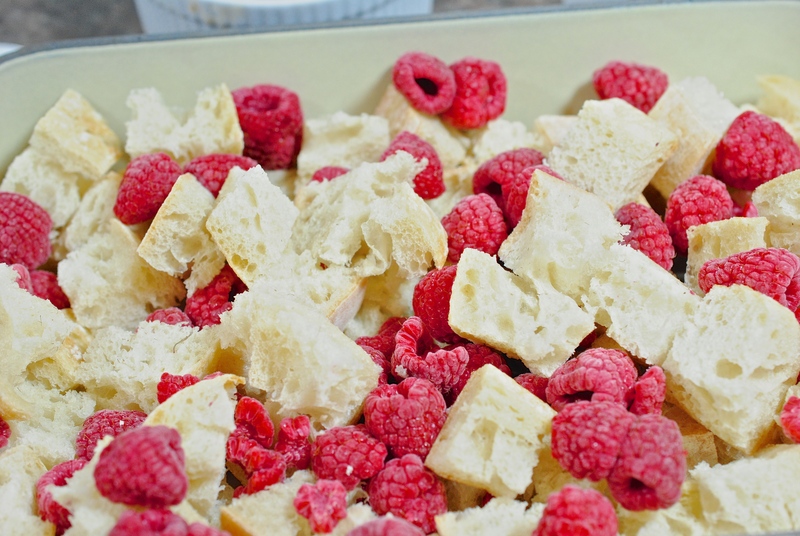 All the ingredients except the raspberries for this yummy dessert. 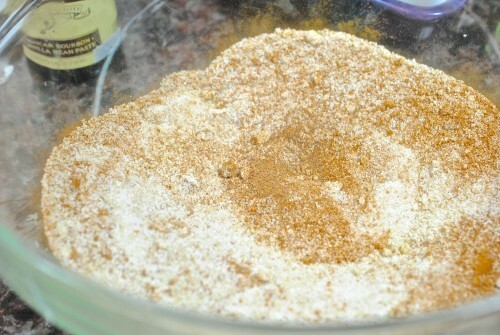 Mix the sugars, cinnamon and nutmeg, divide in half. 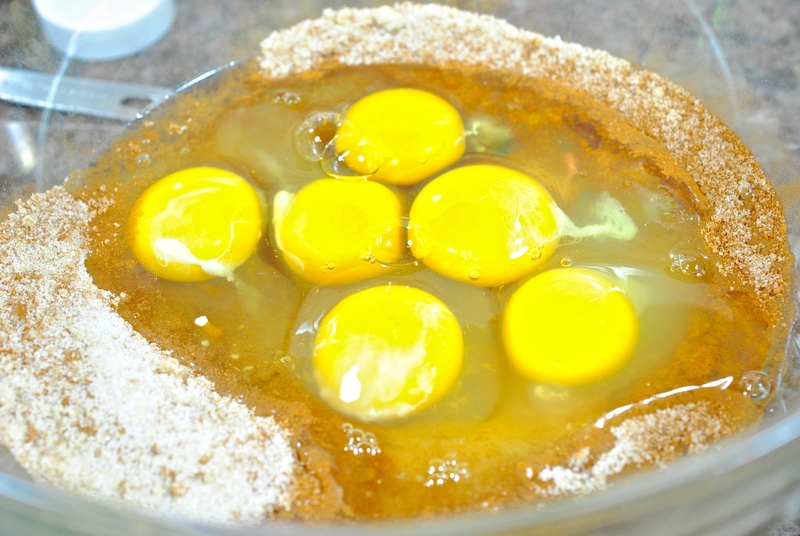 Beat in the six eggs into half of the sugar mixture. 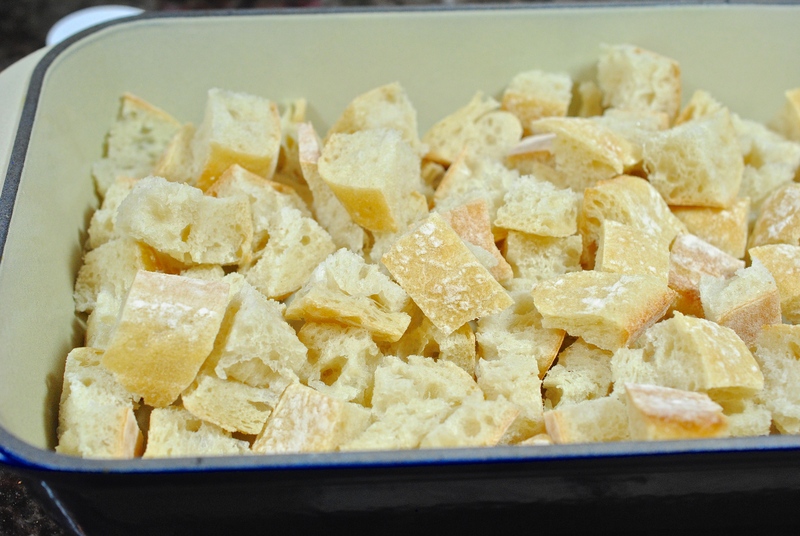 Cube your ciabatta bread into 1″ squares. The recipe calls for 8 ounces of ciabatta and that’s a small loaf. 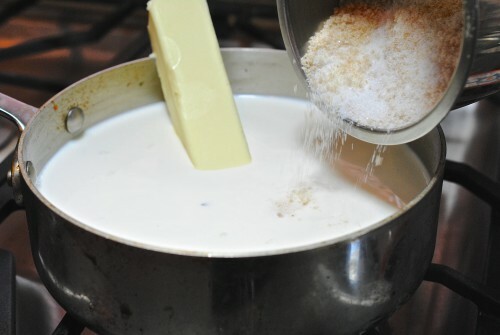 Heat the Half & Half, milk and butter in a saucepan. Add in half of the sugar mixture and bring to a low boil. Turn off heat. Gently add the raspberries to the bread cubes being careful not to break up the fruit. Slowly whisk in the hot milk into the egg mixture being careful not to curdle eggs. Pour the mixture over the bread and raspberries making sure all the cubes get soaked in the liquid. 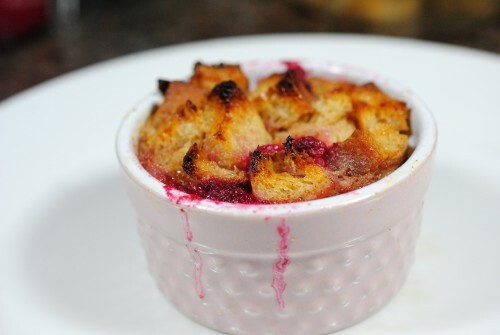 I baked a couple of bread puddings in these cute little ramekins that a friend gave me. After baking, they released very nicely from their containers. Not as pretty as the individual ones but just as delicious. Combine 1¼ cups granulated sugar and ½ (packed) cup light brown sugar; divide the mixture in half and set aside until needed. 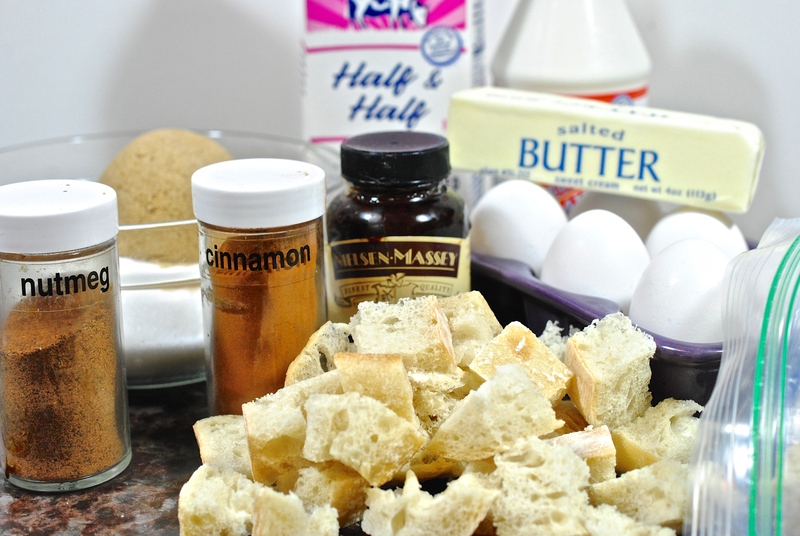 In a large mixing bowl combine half of the sugar mixture with ½ tablespoon ground cinnamon,1/8 teaspoon freshly grated nutmeg, 6 large eggs, 1 tablespoon vanilla extract and 1 pinch fine salt. Heat a heavy-bottomed sauce pan over medium-high heat. Combine 2 cups whole milk, 2 cups half-and-half, and 1 stick unsalted butter with the remaining sugar mixture; bring to the boil. 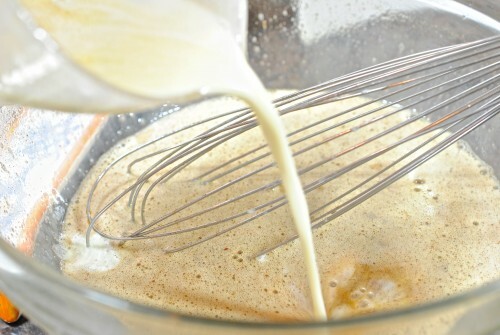 Carefully whisk half of the milk mixture into the egg mixture, being careful not to curdle the eggs (tempering); add the remaining milk mixture and whisk to combine. 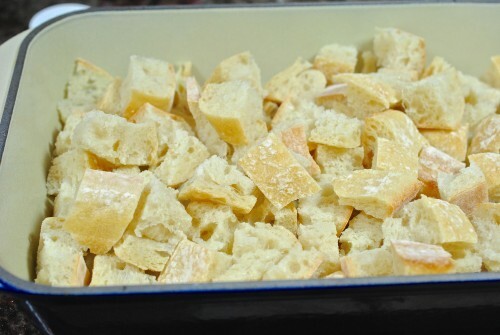 Pour milk mixture over the day old Ciabatta that has been cut into cubes; let the bread mixture stand until it has soaked through to the center. Preheat the oven to 375°F. Pour the pudding mixture into a buttered 9 x 13-inch baking dish. Bake in the preheated oven until light golden brown and cooked through, about 35 to 40 minutes. Top with your favorite Ice Cream or Caramel Sauce. Melt butter in a small saucepan over medium heat. Mix together the sugar and cornstarch, and stir into the butter. Pour in cream and cook stirring frequently until the mixture stars to boil. Continue cooking until it thickens, stir constantly. Remove from the heat and stir in dark rum. Serve this warm with over the Ciabatta Bread Pudding and then drizzle with raspberry sauce. Combine the sugar and water in saucepan and boil about 1 minute. Add raspberries, return to a boil and cook, whisking until the berries are smooth, about 4-5 minutes. Pour mixture into a sieve and press berry mixture to remove seeds. Chill until ready to serve. Isn’t this just the cutest little dessert?